Dental implants treatment has a success rate that is often in excess of 95% but the key to a good prognosis lies in choosing a best dental implant specialist for your treatment. Although many dentists now supply dental implants they may have only completed a short course in this type of oral surgery, concentrating on just one type of implant system. 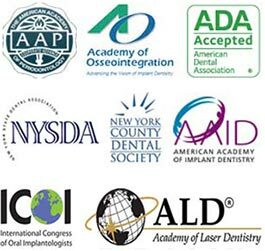 In contrast a periodontist like Dr. Navid Rahmani is a true specialist in placing all types of dental implants and has the necessary skills and experience working in Upper East Side, NYC dental center to make sure you receive the right type of dental implant during treatment that will have been extensively planned before your oral surgery begins. Why Choose a Dental Implant Specialist? When you first visit Dr. Rahmani’s dental implants center on Upper East Side, NYC, your dental implants treatment will begin with extensive diagnostic tests that are not provided by every implant dentist in NYC. He will want to take dental x-rays and a CT scan and he may choose to take dental impressions or photographs of your mouth to help plan your surgery. Your CT scan is especially important as it shows a 3-D image of your jaws. This allows Dr. Rahmani to assess the amount of healthy bone available to insert your dental implant and shows in great detail the position of blood vessels nerves and structures such as sinus cavities, all of which must be avoided during implant surgery. The next step is to plan the actual placement of your implant using all these diagnostic tests. This also takes a high degree of experience and expertise as it is not just a matter of avoiding essential structures, but also making sure the implant is inserted in a way that it can be successfully restored with an implant crown, bridge or denture. Dr Rahmani uses implant or image guided surgery which is an advanced way to plan dental implant treatment. This uses information gathered from your CT scan to provide a 3D image of your jaws and important structures such as nerves, blood vessels and sinus cavities. The information is used to fabricate a stent prior to your oral surgery. This stent is a highly specialized template that is placed onto the gums, guiding your implant dentist during surgery so the implant is placed in precisely the right position. Although good implant surgery is vital for the success of this treatment, you must be committed to looking after your dental implant once it has fully healed and is completely restored with your new tooth. Looking after a dental implant is very straightforward and you will be shown how to clean right around the implant so you remove all plaque and food debris during brushing and flossing. Interdental brushes are highly effective for this task and are very simple to use. Six monthly checkups and cleanings are important for maintaining the health of your dental implant. Any small issues with your implant can be quickly detected and regular removal of plaque and tartar from around the implant will help maintain its integrity. Who Should Have Dental Implants? Dental implants are most suitable for healthy people who do not have any existing dental problems or any substantial problems with their general health. 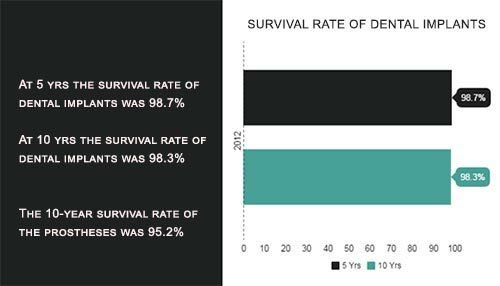 Success rates for dental implants in reasonably healthy people are generally 95% or more. Provided you have a reasonable level of health, age is not a barrier and treatment can be provided once the jaws have finished growing. Implants are especially good for older patients with loose and uncomfortable dentures. It is important for Dr. Rahmani to know the medical history of every patient prior to implant surgery as sometimes certain medications or other health conditions may mean treatment is unsuitable. Dental implant treatment may be less suitable for people who smoke as nicotine and other toxic substances in cigarettes affect healing and impair blood flow. If you smoke then this habit can slow down osseointegration, greatly increasing the risk of implant failure. The rates for implant failure are twice as high for smokers. There is an increased risk of developing peri-implantitis if you continue to smoke after dental implant treatment. Quitting smoking before dental implant treatment will greatly improve the chances of your implant treatment being a long-term success. Diabetes affects the immune system and can impair healing, increasing the risk of implant failure. However, some diabetics may be suitable for treatment providing their condition is well-controlled. If you are able to successfully control your diabetes then it is worth discussing your suitability for dental implants with Dr. Rahmani. Osteoporosis is common in postmenopausal women and can result in jawbone loss. It is possible that osteoporosis may affect the process of osseointegration, where the implant post bonds with the jawbone. This is because the condition is commonly treated with oral bisphosphonates and may in very rare occasions lead to osteonecrosis resulting in the destruction of the jawbone, but this problem is more usually associated with patients who receive intravenous bisphosphonates for other serious diseases. If you are affected by osteoporosis then Dr. Rahmani can assess you for your suitability for treatment based on your current medications and general health.